I made TWO runners out of one Turnover!! For those of you unfamiliar, this is what they look like. I used a Turnover of Civil War Homefront by Barbara Brackman for Moda. 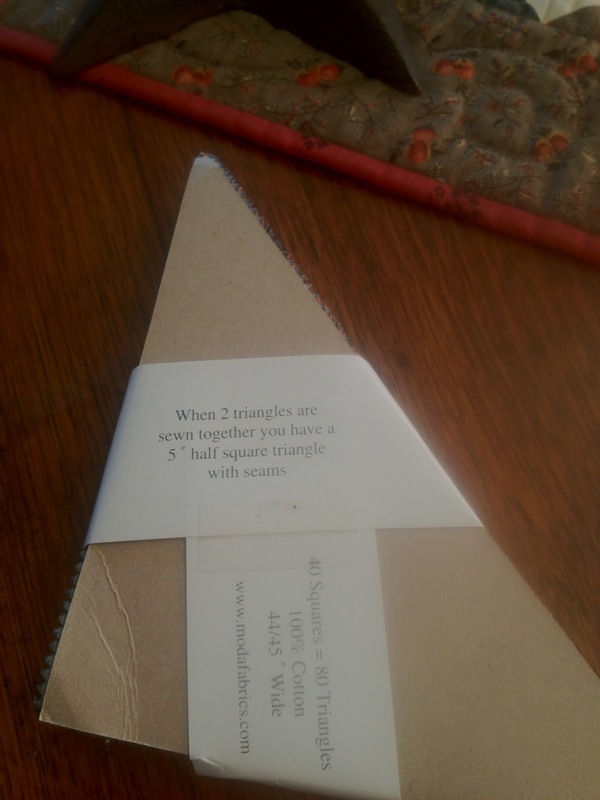 I sewed all my triangles together to make 40 half square triangles. Easiest HSTs I have ever made!! 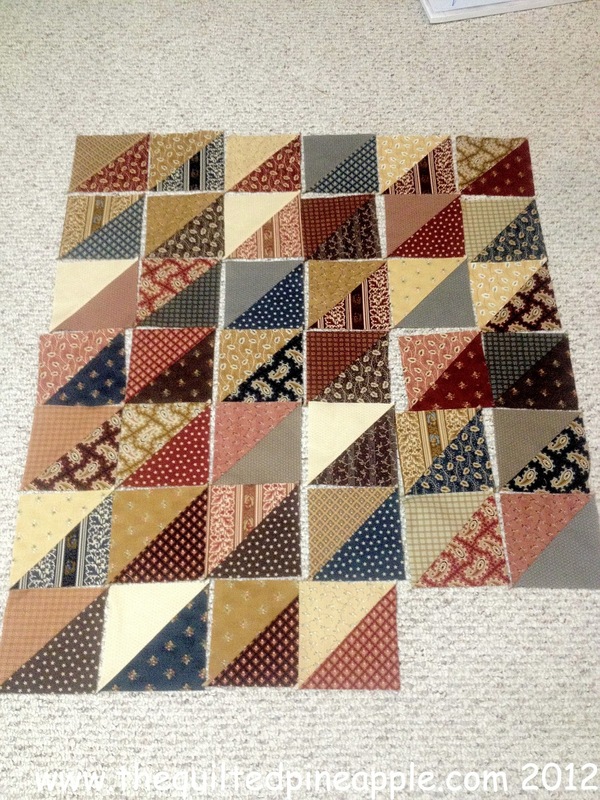 Sew two HSTs together to make two hourglass blocks. Sew the hourglass blocks together to make a runner. Then quilt, bind and wash! So easy!! A fast and beautiful runner! 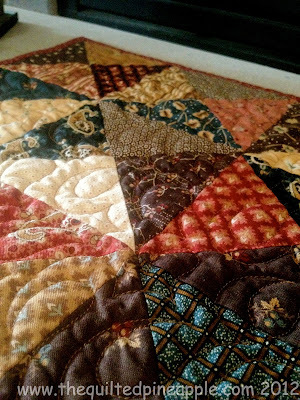 I just quilted a freehand allover design. Fast and easy, but gets the job done. I used a Jo Morton fabric for the back. The binding is some reproduction fabric from Marcus Brothers I had in my stash. I think it is probably 10 years old!!!! 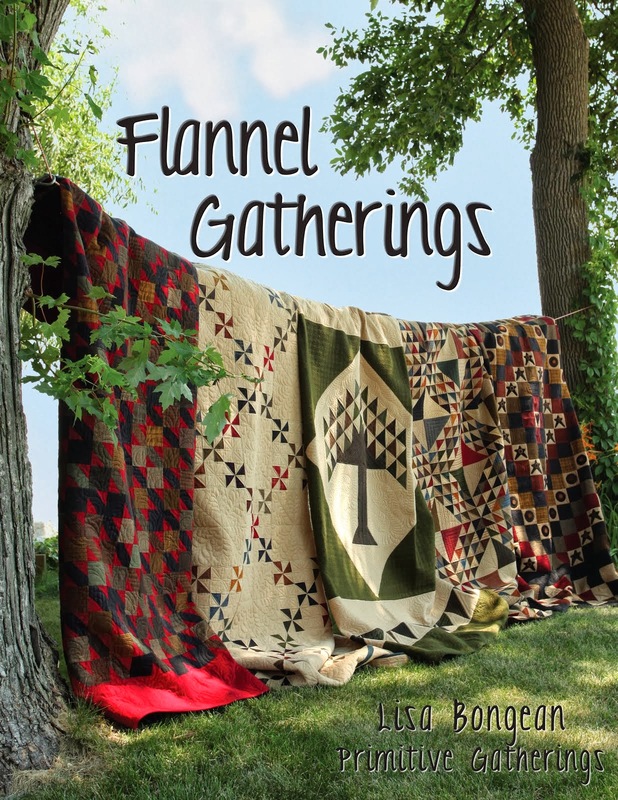 It was one of the first fabrics I bought when I started quilting!! 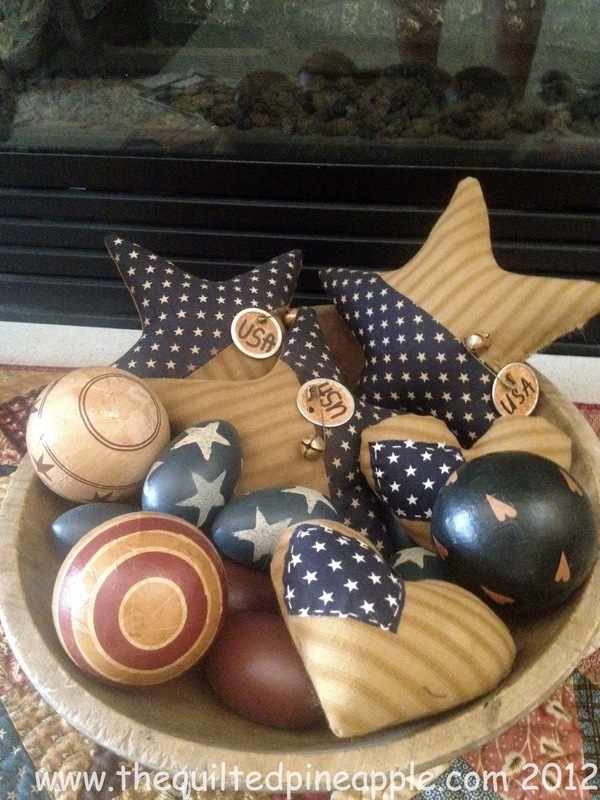 The patriotic heart and star bowl fillers are more wonderful creations from Denise at KKL Primitives. 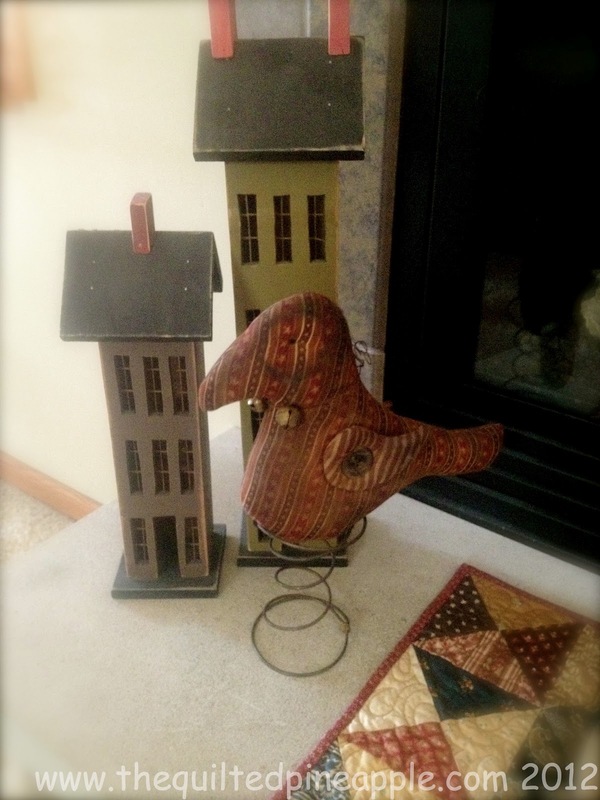 As well as the Bird Nodder. He is a personal favorite of mine!! 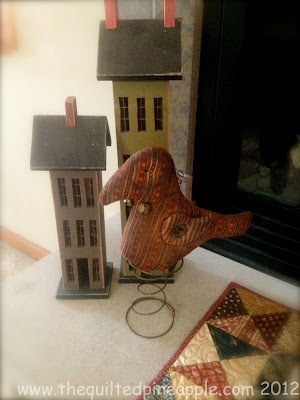 :-) Denise always has beautiful things to sell on her blog here. 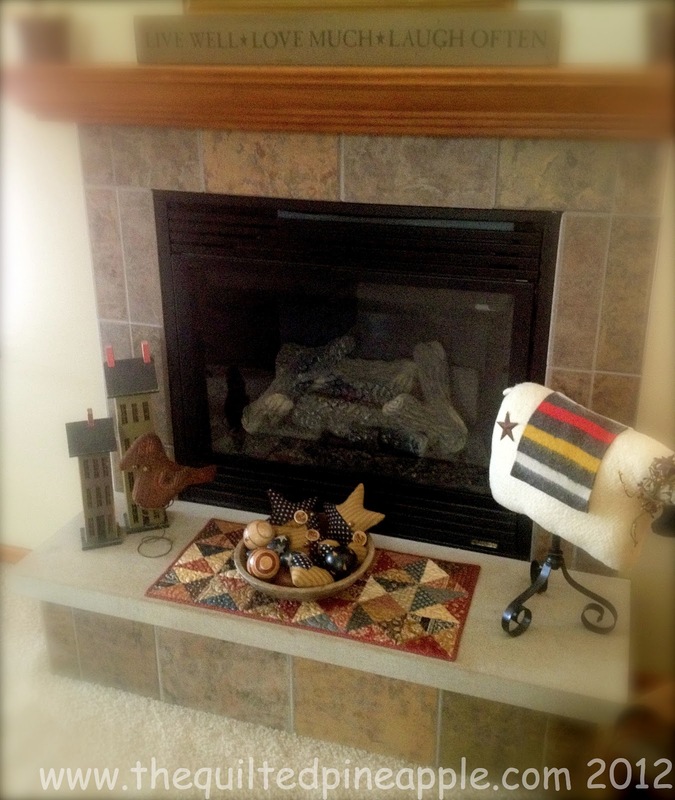 Runner looks nice on the dinning room table, but I like it on the hearth better. 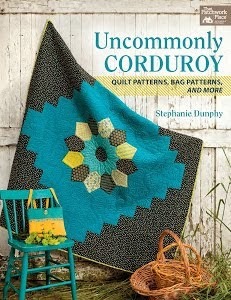 Or I could even use it on my eventual wall of small quilts. :-) It is nice to have options. 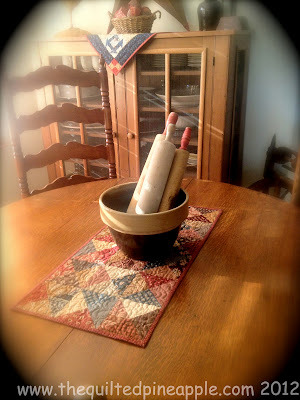 I picked up some vintage rolling pins last spring. They make great fillers for crocks!! I think you know how much that means to me. Especially the next 50. Love you girlfriend. Lovely little runner! 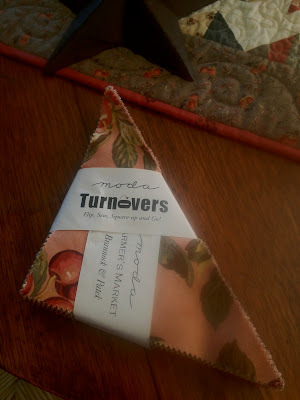 I've not used turnovers for quilting...only ever eaten them ;) !! Happy Birthday to Patti! She's going to love her little runner, Linda! They are so cute! I've ignored these turnovers, too, but now that I see they are calorie-free, the sky is the limit! You know, I have never bought turnovers before. I just got introduced to charm squares. I have a bunch of cute charm square packs that I should make a couple of runners out of it. Your runner is so adorable that I should really try that. Your friend Patti I am sure will love hers and Happy 50th to her! I've never seen a turnover before. Great looking small project. They are great! Happy Bithday to Patti. 50 is the new 30. I keep telling myself this because I will be 50 soon. Love your runners and all your pictures! You are quite the photographer...love it all! I love all your decorations in your home - you have such a great sense of style. 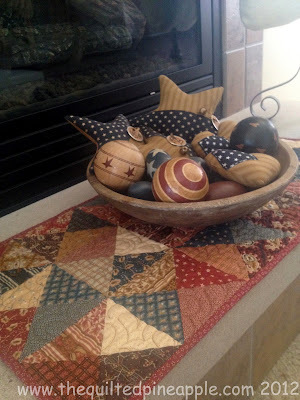 I have never thought of putting a runner on the hearth - great idea.
. . . .Now that I have my internet back. . .gonna be shopping for those littlr turnovers tomorrow. I think you've re-energized the turnover business. Can't believe our Patti is 50. I still remember her as a tot in a wooden encyclopedia box! Your birthday gift to her is beautiful. 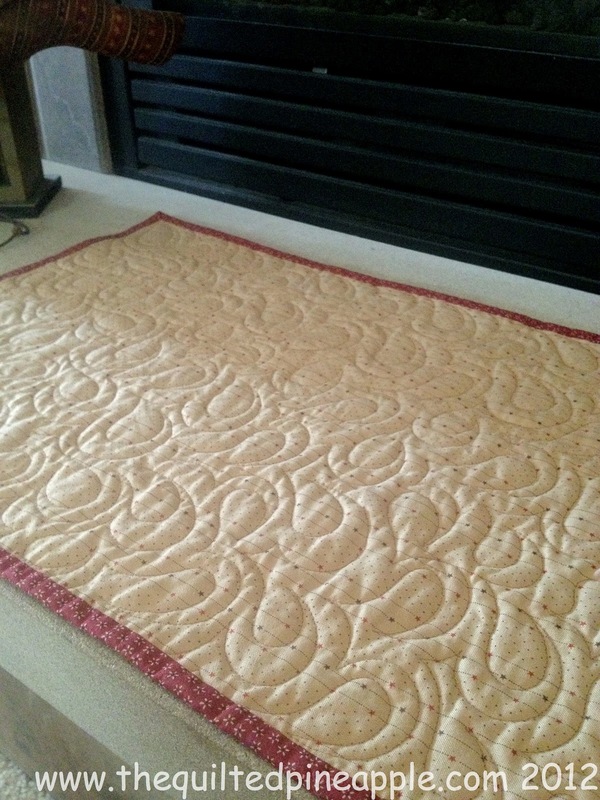 Your table runner is Awesome! I've never worked with turnovers before. Now I'm anxious to purchase a few! Thanks for sharing. So sweet! I've never bought turnovers either!! Happy birthday and hugs to Patti! Sorry I missed the b-day, Patti! I love your runner. I have passed on turnovers before, too. But now you've turned me on to them. Bad girl. Like I needed that. Your decorating is so great. Wish I could put things together like you do. Love the tablerunners and Patti is a lucky girl to receive one for her b'day! I love turnovers and have several stacks in my stash. Love the crocks with the rolling pins! You have such pretty displays. 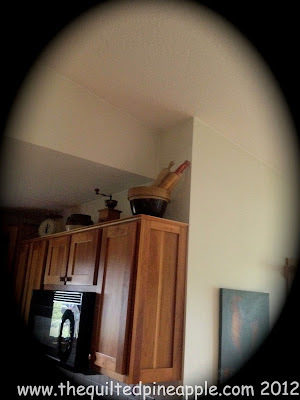 I love the rolling pins. I've never used a turnover but they certainly do seem to have endless possibilities. Pretty projects. I love your table runner! Happy (belated) birthday, Patti! !